The end of the world is close. Thambi must act fast, for his survival is at stake. To escape a tragic end, he must climb up to a treetop, and a team onboard a chopper will come to his rescue. 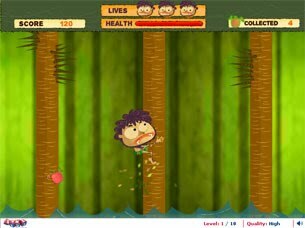 Help Thambi get there as soon as possible in Treetop Survivor! Press ‘up’ to climb, ‘left’ and ‘right’ keys to flip on the sides of the tree. Press ‘left’ or ‘right’ twice to jump to adjacent tree. Avoid spikes, snails, glue patches, insects and snakes. Collect apples and Life leaves. You can win a ‘Survival of the Fastest’ Medal for making a score of 6000 points!